Why is UT in Austin? A statewide election placed UT in Austin. Or was it in Tyler? You decide. On the final day of March, 1881, Governor Oran Roberts signed the bill that formally established the University of Texas. Among its provisions, the campus was to be placed “at such locality as may be determined by a vote of the people.” though it allowed, if the voters chose, to separate the medical department from the main university. Roberts called for a special election on September 6 and declared the city of Austin a candidate. But while the capital city was an acknowledged favorite, history had taught its citizens to be wary of competition. 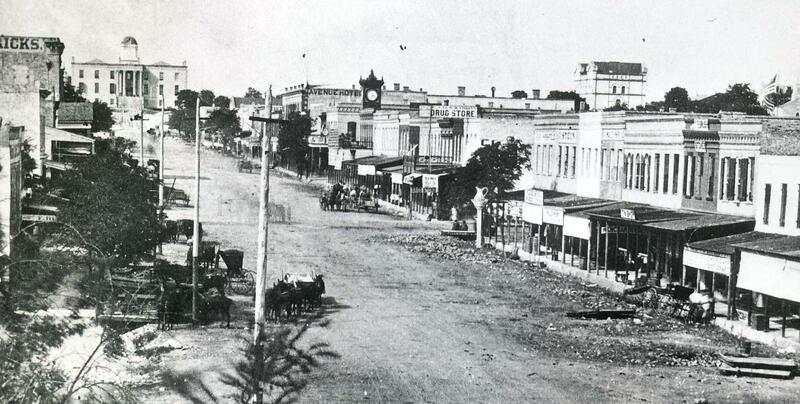 Above: Austin in 1881. The view up Congress Avenue to the old Capitol building. Austin was founded in 1839 to serve as the capital of the Republic of Texas, but when Texas joined the Union in 1845, its status as a state capital had been provisional. It wasn’t until 1872, when the city defeated Houston and Waco in a statewide election, that it formally became host to state’s government. In order to win the University, Austinites knew they would have to campaign. Alexander Penn Wooldridge (known as “A.P.” to friends) was the young and energetic lawyer chosen to lead the Austin effort. Born in New Orleans, educated at Yale and the University of Virginia, Wooldridge arrived in Austin in the 1870s and quickly established himself in social and legal circles. He was the driving force to organize the city’s public education system, chaired the first Austin School Board, and would later serve as Austin’s Mayor. A 14-person committee assisted Wooldridge in the effort. Along with ads in newspapers, Austin promoted itself on bills hung on the walls of county courthouses and post offices, an effective medium at the time. Supporters state-wide sent lists of friends and acquaintances to committee members in order to compile an enormous mailing list. By June, as the summer sun warmed the state, the temperature of the location debate also began to rise. Along the heavily populated Gulf Coast, Galveston and Houston worked together to convince voters to divide the campus, then competed against each other for the prized medical department. Galveston’s campaign was more aggressive, and it published a letter to voters similar to Austin’s address. As the largest city in Texas at the time, Galveston bragged about its two hospitals where medical students could receive practical experience and “closely watch the progress and treatment of different diseases.” The city already had a small medical school, the Texas Medical College, and its facilities were to be turned over to University. Because Galveston was a port city, it also “boasted” of having a greater variety of illnesses to observe. Houston’s chief spokesman, State Senator Charles Stewart, countered by pointing out that his city was a major railroad depot, and was therefore subject to a greater number of visitors. “I can safely say,” Stewart crowed, “that there are ten, nay perhaps a hundred railroad travelers to one by ship.” The senator also mentioned the frequency of injuries suffered by railroad workers, and declared it would be “God-giving charity for Texas to locate her University where these men could receive proper care and treatment.” Fortunately for Texas, tourism wasn’t yet a major industry. The contest between Galveston and Houston as to which was the most disease ridden and injury prone wouldn’t have fared well in a vacation brochure. The town of Tyler, about 200 miles northeast of Austin, was another candidate for the main campus. It was ready to contribute the unused ten acres of the defunct Charnwood Institute, and offered its own opinion of the capital city. The Tyler Courier warned not only of the “din of drunken legislators” in Austin, but declared the city’s white limestone buildings were “so blinding to the sight that green goggles are peddled like peanuts upon the streets, and that sore eyes and blindness are the frequent result.” Tyler’s citizens were understandably upset. One of their favorite residents, Governor Roberts, was publicly supporting rival Austin. Not to be outdone by the larger cities, several small towns also submitted bids to host the University. The Cleburne Chronicle advocated placing the campus at Caddo Peak in north central Johnson County, because it was a “moral place” and far away from the “busy haunts of man – and woman.” Thorp’s Springs, just south of Fort Worth, declared that “no intoxicating liquor will be allowed within four miles of the University,” as soon as it got it. As its final task, the Austin campaign committee was charged with designing, printing, and distributing the ballots for the election. The committee was aware that most voters in the state favored a separate medical branch, but many of those who supported Austin also wanted the entire University. To complicate matters, Governor Roberts’ proclamation had announced the capital only as a candidate for an undivided campus. This posed a serious problem. Voters who favored a separate medical school might choose a town other than Austin for the main site. If Austin was to receive enough votes for all or part of the University, the ballot had to be skillfully worded. Wooldridge devised a ballot that presented to the voter all of the possible choices, but was decidedly biased for Austin. 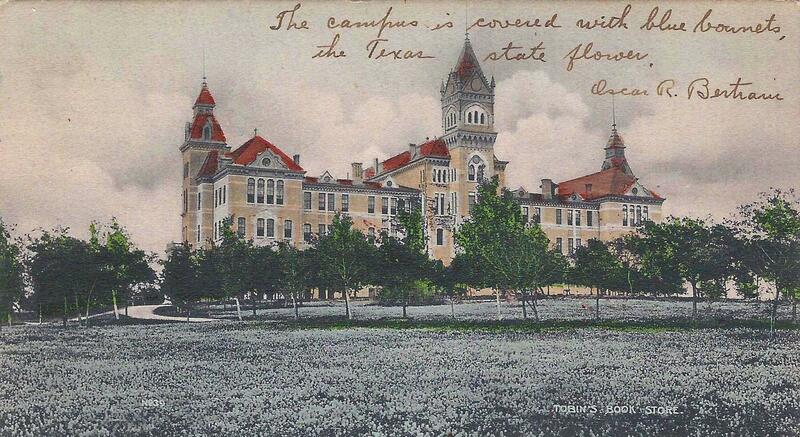 Approved by the committee, the ticket read, “For” or “Against” separation of the departments and, “For Austin for the Main Branch.” Blanks were included to write-in a choice for the location of the entire campus, and, if needed, the preferred city for a separate medical department. But to vote for another city for the main branch, the word “Austin” had to be physically marked out and another written in its place. The committee suspected the ballot might upset Houston and Galveston, as it allowed for the possibility of an undivided campus, but hoped Austin’s supporters would be content with the design. Instead, Austinites thought the committee had cleared the way for the separation of the University. No one was satisfied. As expected, Houston and Galveston cried foul, and charged Austin with selfishness for wanting the entire campus. By early August, rumors reached the capital that an alliance had formed between the gulf cities and Tyler to deny Austin any part of the University if it should, directly or indirectly, oppose a detached medical branch. If the Austin committee’s ballot was used in the election, Houston and Galveston threatened to vote for Tyler for the main campus. Despite the high visibility of the campaign, voter turnout for the special election was expected to be small. The danger of a coalition against Austin was real. The Austin committee sought a legal interpretation as to the form of the ballot and tabulating procedures, and addressed an inquiry to the State Canvassing Board. The Board consisted of Governor Roberts, Attorney General James McLeary, and Secretary of State Thomas Bowman. On August 19th, the Board released its opinion, which was a lengthy and divided one. Roberts and Bowman concurred, while McLeary dissented. McLeary argued that if separation won, votes for an undivided campus should be ignored. Roberts and Bowman declared that if the voters opted to separate the medical branch, the votes cast for both the main branch and the entire university would be counted, and the city with the largest combined total would win the main branch. Turnout for the election on September 6th was indeed sparse. Less than eighteen percent of eligible voters cast ballots. 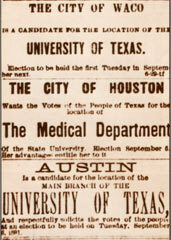 When the results were announced, Austin was declared the winner of the main branch and Galveston the seat of the medical school. Out of 56,480 votes, 38,117 were in favor of division to 18,363 against. Austin received 16,306 votes for the main branch and 14,607 for the entire university, for a combined total of 30,913. Tyler was second with 18,420 votes for the main branch, but acquired only 554 for the entire campus, for a sum of 18,974. Galveston and Houston had remained true to their word. If the canvassing board had dismissed the ballots for an undivided campus, the University’s main branch would have been located in Tyler. This entry was posted in Uncategorized and tagged Austin, election, location, medical school, Texas, University by jimnicar. Bookmark the permalink.